Right now Marvel is the king of crossovers with all of their standalone characters popping up in each other's movies and leading up to The Avengers films every few years. But there's another cool crossover happening this fall, though you won't catch it on the big screen. 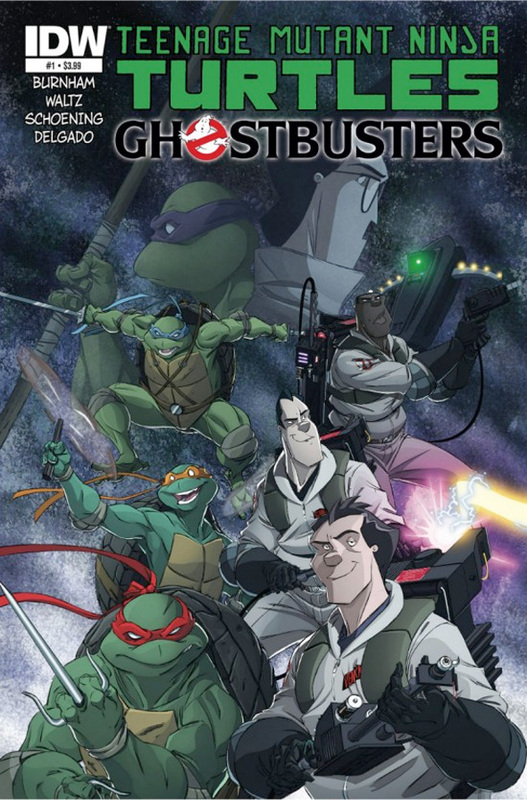 Instead, IDW Publishing has a comic book mash-up of Teenage Mutant Ninja Turtles and Ghostbusters. That's right, the heroes in a half-shell and New York's best paranormal investigators will meet just like The Jetsons and The Flintstones. The story will be a four-issue arc, and if you're wondering exactly how these two universes come together, just keep reading. Here's the story: “When a new invention goes haywire, the Turtles are sent to a whole new type of New York City. One with a whole lot more ghosts… and Ghostbusters! The two teams will have to learn to get along quickly, because a new foe from the Turtles past has followed them and aims to conquer NYC!” So it keeps both universes intact without making it seem like the two groups have somehow lived in the same New York City this whole time without having heard of each other. The comic is written by Erik Burnham & Tom Waltz with artwork by Dan Schoening. It hits shelves sometime in October, so be on the lookout this fall, but don't expect this comic book to end up on the big screen. Cool? So your telling me a TMNT, Ghostbusters, Transformers, G.I.Joe, He-Man, Gremlins, and Freddy Krueger crossover could still potentially happen!? I kind of hate IDW because they just play up on nostalgia without really great story telling. The zombie cross over they tried to do across Star Trek, Transformers, Ghost Busters and GI Joe was a flop and not very fun. I'm kind of interested in this, but chances are it'll be a lot of bad puns, a story that's not very strong and there'll be no real reason for it to exist other than to say "look at these two things you love" It's the same problem I have with all those daily t-shirt sites. They just grab two things and smash them together without any reason. Mash ups need to feel natural and coherent. I keep saying...whether it's primarily in the movies or introducing them to the comics...they should make a crossover of the turtles with street sharks! Their origins are practically the same and they'd make a formidable team! Ghostbusters and X-Files would be awesome. I think they did that.